Juan Morel is heading back to the Olympia! 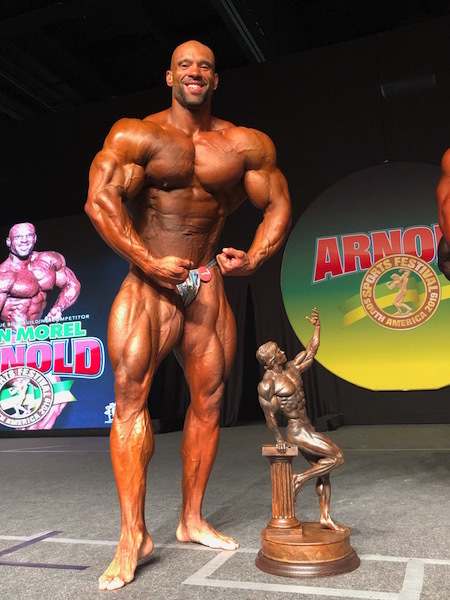 The Arnold Classic in Ohio is considered the second largest show in bodybuilding but to win any of the other Arnold shows around the world, like the Arnold South America, is considered a big win. To be on stage interviewed by Arnold Schwarzenegger is an honor in itself and of course victory means a qualification to that season’s Mr. Olympia competition. Juan Morel is familiar with the Olympia stage, having competed there on three occasions. His last appearance was in 2018 where he placed outside the Top 15. 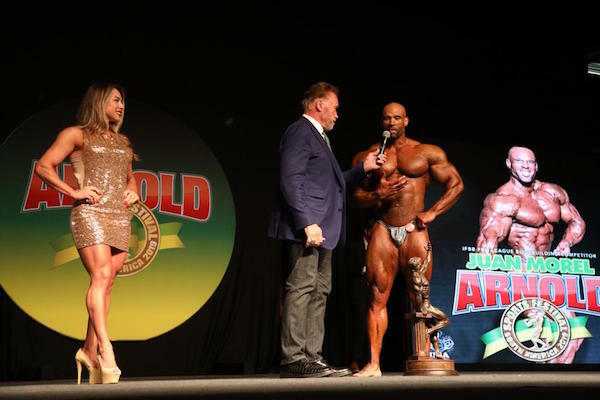 He picked the right show to enter and got into great shape, and thanks to those efforts in Brazil, he got to stand onstage with Schwarzenegger and will now be moving on to Las Vegas in September to compete in the biggest show in bodybuilding. He was big, full, and had great symmetry. He also had to make sure each pose was more impressive than the last because he was in a tight battle with home country favorite Rafael Brandao. Fortunately for the New York native, the judges saw that Morel was bigger and in great condition. If condition is close, size will win every time. That was what helped Morel here. Brazil’s young muscleman has nothing to hang his head about here. He is competing as a rookie and was being compared to a man who has been considered one of the Top 10 in the sport before. Morel’s muscle maturity and size gave him advantages but there is no doubt that Brandao’s time will come sooner rather than later. Williams has competed a few times already and seemed to be getting better each time he stepped onstage. Unfortunately he had to deal with travel issues getting to Sao Paulo and didn’t have his tanning or oil on as he would’ve wanted so that led to him not looking as good as he could have. Since this is a two day show, he had time to improve over that next 24 hours which helped him in the placings at the end of the show. Had it not been for the travel issues earlier, who knows what may have happened here? Dubai’s Obaid was actually in 3rd after prejudging but was placed below Williams in the finals on Saturday night. He looks great overall and being in the Top 4 of an Arnold show deserves a tip of the cap but he has looked better than he did here. Should he compete again this year, he’ll adjust his game plan and likely will be better next time.